"I know I'm a bit of an enigma to a lot of people," Enya says, "but it's something I don't really think about because my work is the music. I've never had to sell the music because of how I lived and I'm very happy about that. I'm quite private. With my music, I am not. That's the one time I open up all my emotions and I feel I've given all this to the public and I like to retain a part of myself that will always be private. I think it's quite humane. It's very ordinary to want this." .......the unexpected commercial success of Watermark complicated the process when she and Roma began Shepherd Moons. "I put a lot of pressure on myself at the beginning," she says. " When I was composing new melodies I kept thinking 'Would this have gone on Watermark? Is it as good?' Eventually I had to forget about this and start on a blank canvas and just really go with what felt right in the studio." Three years ago, a little-known Irish singer who went by the name of Enya put out an album called Watermark. It certainly wasn't rock - no backbeat here - nor was it conventional pop. It might have been considered New Age, but it had more presence, more persuasive emotional power than most so-called New Age efforts. Some of the lyrics were sung in Gaelic, some in English. The album, featuring layer upon layer of multi-tracked harmony vocals and waves upon wave of gorgeous melodies, had a spiritual, mystical quality. It sounded like a soundtrack to an unmade, pastoral film. A thread of water imagery was woven through the album. One song, 'Orinoco Flow (Sail Away)' had a particularly irresistible chorus. Ethereal. Enya wasn't thinking about having a hit. Her thoughts were, she recalls, "'Will anyone listen to this?' When I finished it, I thought 'What have I done? Is it to be listened to?'" Oh yes. 'Orinoco Flow' became a surprise smash hit, both in Europe and in the United States. 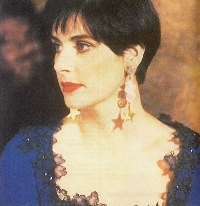 And Enya - born Eithne Ní Bhraonáin in Donegal County - sold more than four million copies worldwide of Watermark. Enya's success was part of a meticulous team effort. Enya writes the melodies; her longtime friends Roma and Nicky Ryan handle lyrics and production, respectively. The trio is back with Shepherd Moons and its out-of-the-box reception would suggest that Watermark was not a fluke. Shepherd Moons, on the Warner Bros. label, has sold more than 250,000 copies in the United States in just over a week. In England, it's at the top: It entered the UK chart at no. 1. Enya, who is 29, didn't exactly go bonkers when she found out. She says she was in Europe doing interviews to support the album and heard about it while travelling. "We don't ponder on these moments," she says, "which is unfortunate at times because at the moment we were busy. You never get the opportunity to sit down and say, 'Wow.' Eventually, when we get home we meet up with Roma, the three of us will sit down and say, 'Wow, what an achievement.'" Actually - if her tenor during this phone interview is representative and descriptions from people who've worked with her are accurate - it would seem Enya rarely goes bonkers. Enya, who recorded two soundtracks The Frog Prince and The Celts prior to Watermark, comes across as a serious, private person - the Jodie Foster of the music world. She doesn't enjoy discussing her work prior to her solo career, when she sang with older members of her family in the Celtic pop band, Clannad. Enya says she's pleased that her fans tend not to gush when they meet her. "What happens," she says, "is that a lot of people have a wonderful respect for the music which comes across in the way they talk to me. There is no big problem as far as a star trip. I find that people will walk toward me and say, 'Thank you for the album. My favorite track is ...' and then they just walk away. It's really nice because I like to hear this. Enya admits that the unexpected commercial success of Watermark complicated the process when she and Roma began Shepherd Moons. "I put a lot of pressure on myself at the beginning," she says. " When I was composing new melodies I kept thinking 'Would this have gone on Watermark? Is it as good?' Eventually I had to forget about this and start on a blank canvas and just really go with what felt right in the studio." Shepherd Moons serves as a perfect companion disc: It's a soothing, gently stirring record featuring the massed voices of Enya. She record multiple harmonies - as many as 500 parts on one song, and then they later select how many to use. "You cannot tell what one track wants and it doesn't necessarily mean that it will work for the next track," she says. "So basically, it's very experimental and spontaneous. When I've written the melody I know exactly what the melody is looking for, but achieving that takes a while." "Melody is really important. I'm looking for something that is saying something very strongly to me, emotionally. I feel if this happens, then it's strong enough to work on. But this takes time. I record a lot of ideas and listen back and eventually I know that a melody will evolve from all this work. But sometimes it's so difficult to know. And what's it going to be like?" After Enya's done the melodies, Roma sets words to them. Enya says they've never had a conflict about those words. "She feels strongly about the melodies," says Enya. "They move her in a different way, but just as strongly as they move me. And it's very personal with her. And she's always known me - for a very long time. She's observant of what I like and what I like to sing about, and it's always worked in that way." Can music this intricate be duplicated in concert? Enya isn't certain. "I think it could be possible to take the music to the stage," she says, "but it's not possible, I feel, to take the same sound onstage. I'd like to do it as acoustically as possible, with an orchestra, with other people vocalizing and try an (sic) incorporate some drama. But this is just talk at the moment." Note: Note: Transcribed by Geoff Arnold and posted to rec.music.newage on 6 December 1991. This article is similar to another by the same author that appeared two days later in San Jose Mercury News.